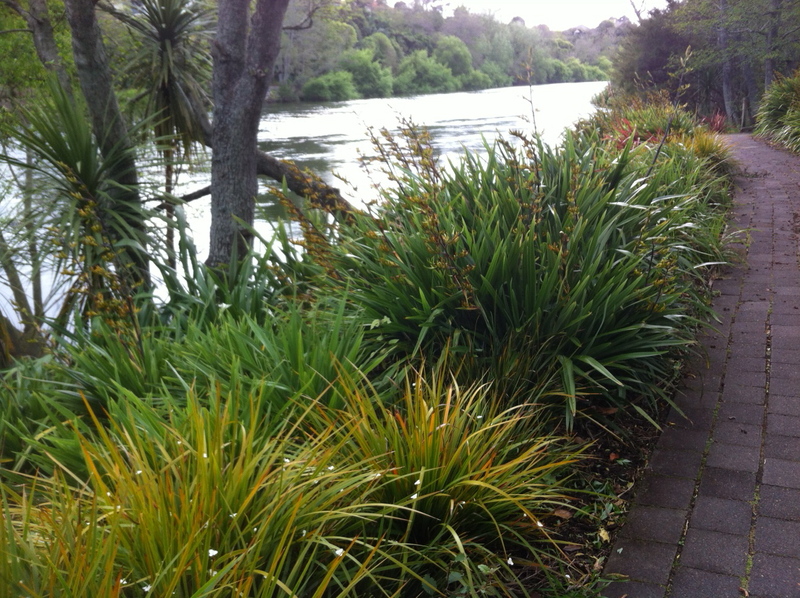 I am living right on the Waikato River – I walk out our section onto the amazing path that winds for kilometres on both sides of the river. It is fantastic to walk and cycle on. It is mid October and right now the Kowhai are flowering, the flax heads are reaching for the sky and the ringa ringa are about to blossom. The Tui are going mad drinking nectar and singing. There are heaps of other fantastic cycleways in the Waikato. 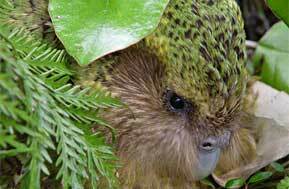 Maungatautari is an exciting place – with 47kms of predator proof fence enclosing 3400ha it is the largest ecological island on mainland New Zealand. 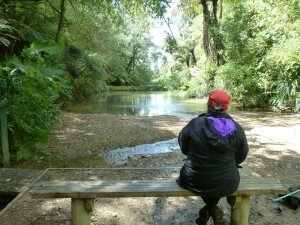 I have been twice to Mangatautari, and it has to be on my favourite bush reserves, just 40 mintues drive from Hamilton. You can do anything from an hours stroll to 6 hour tramp. On our first trip several Takahe followed us, kakariki flew across our path, and the view from the viewing platform was spectacular, with Rata flowering around us. Raglan is on the wild west coast in the Waikato – it is 45 minutes west of Hamilton by car on State Highway 23 (SH 23) It is best known for surfing and the arts. The village of Raglan has some great shops and cafes and you can feel its hippie roots, we really enjoyed our meal and the ambience at The Shack on the corner of Bow Street, but there is obviously lots to choose from here. Take time to walk around the beautiful Raglan harbour foreshore. You have to journey a little further to find the beach at Raglan. 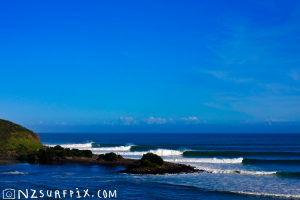 I am not a serious surfer, but this is known to be one of surfing spots in New Zealand. I am a walker and my dog loves the beach and this beach is perfect for stretching out. We went in search of a rare New Zealand Orchid – which we did manage to find, but you have to know what you are looking for – they are the size of fingernail! But this is definately not the only reason to visit this magic place. 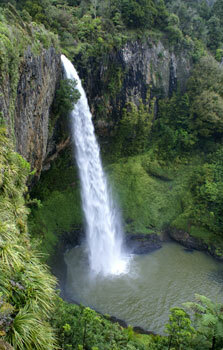 A wheelchair friendly track is just a 20 minute walk to the spectacular 55 m falls. The best bit is for those who can handle the 135 steps which will take you to midway viewing platform, – to get to the bottom of the falls you will be going down 261 of them in total. My knees are challenged by this many stairs, but it was worth it, and the new stairs make it easier going. 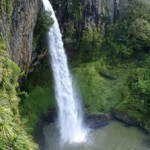 Waireinga is the Maori name for the area and it means leaping waters, referring to wairua (spirits) leaping the great height of this waterfall. 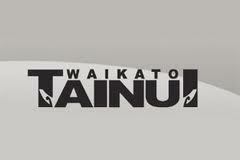 Waireinga is also spiritually known by tangata whenua (people of the land) to be occupied by Patupaiarehe (Maori fairies) who are kaitiaki (guardians) of the area. Hamilton Gardens are world famous and deservedly so in my opinion, and I am not your average keen garden goer. But these gardens are specatcular. 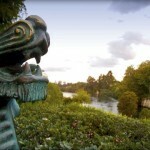 The blend of NZ native fauna, the position on the Waikato River, the garden rooms celebrating the garden cultures of the world. The Hamilton Gardens are a must see in Hamilton. I did the first part of the Hakarimata walkway yesterday – in the hills to the west of the township of Ngaruawahia. We walked up to the Mangarata Dam – built in the 1920s as a water supply for Ngaruawahia. 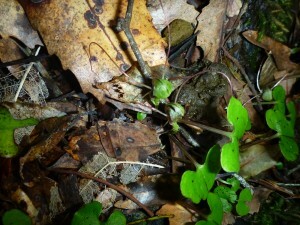 We walked through some lovely bush, some huge Kanuka, and being October, lots of flowering Rangiora, Oleanda and clematis. There are a few stairs to the Dam, but this is not a hard walk. Cynthia said that over the ridge, further on the track there were large Kauri, and we could see their tops standing up above the ridge. Serious trampers will want to go further on this track, but I enjoyed the one hour walk up the meandering stream to the dam.